"Want To Save Time And Money? Here's How To Get Streak Free, Spot Free And Lint Free Cleaning Now Environmentally Friendly and Simple to Use Dry or Wet, With Just Water, and Easy To Clean. Use Dry on electronic device screens and eyeglasses, lens etc to remove smudge and grime. Easily Cut to size. Use Wet on any non porous surface to get sparkling clear polish like results on glass, mirrors, glassware, stainless steel, cars and many more surfaces Simply Wet, Wring, Wipe and let surface dry with no streaks, scratches or lint left behind. Washes easily with just laundry detergent, separately in your washing machine No More Paper Towels or Expensive Chemicals." 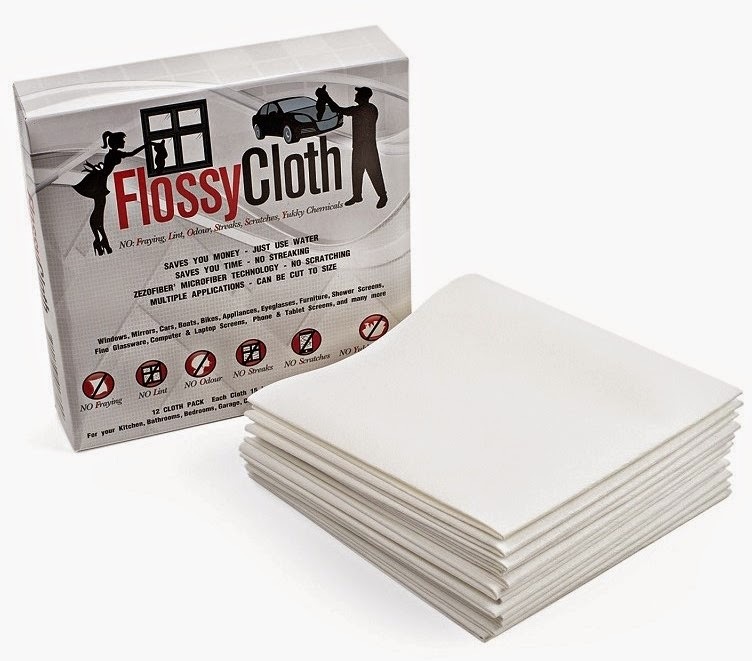 I was sent a pack of (12) cloths from FlossyCloth to review. Each pack costs $29.95. Shipping is free with Amazon Prime. This box of FlossyCloth was a little smooshed when it arrived. However, this didn't affect the product at all. The box measures 8.0" x 8.0" x 2.0". The front of the box labels the product, brand, and sizing information. The back of the box is where you open and close it. Each side of the box features the product information, and it has the manufacturer's information. When I opened the box, I found the FlossyCloth, and on top was an instruction manual, and a sample sticky pad. I love the sticky pad, so I've put that to good use! Each cloth is very durable, and can be cut into smaller segments. Able to be sectioned out. Really does what it says it does! Way better than paper towels. The box was smooshed when I received it, so I recommend better packaging. These have been absolutely phenomenal. I've been using them everywhere. I love them for my car, it's so simple! I've also found them to be great for cleaning the inside of my fridge. They are extremely tough-- you can't rip them. I like that I can cut smaller sections out and use them piece by piece. 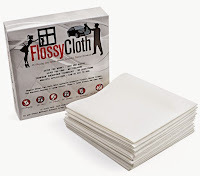 Are you wanting to try FlossyCloth Microfiber Cloth, too? Click the link below, and order away!